Imogen Usherwood in Culture & Arts Drama on 9 February, 2019. Truth is stranger than fiction – but how closely related are they? This is the question Jane Austen asks us again and again in Northanger Abbey, her satirical novel that pokes fun at the craze for gothic fiction of the early 1800s. Our heroine, the enthusiastic and fiercely loving Catherine Morland, is a devotee of the works of Anne Radcliffe; when she arrives in Bath and meets the dashing Mr Henry Tilney and his gentle sister Eleanor, she is enchanted by the idea of their family home the moment she hears its name. Armed with the fantastic expectation supplied to her by The Mysteries of Udolpho, she soon constructs a romantic, horrifying plot behind the seemingly ordinary Tilney family. As a bookworm, what first drew me (and millions of other readers) to this story is Catherine’s capacity as a heroine who devours books, now a popular trope that lives on in the likes of Hermione Granger, Matilda Wormwood and Scout Finch. But Catherine favours one genre in particular – she loves “horrible” books. Her overactive imagination transforms Northanger into a gothic fantasia with skeletons in its closets, both literally and metaphorically. What better setting than the historic halls of University College, and what better way to bring these high ceilings and ancient tapestries to life than in promenade, following our heroine on her first venture into society? My intention was to bring to life Catherine’s imaginings, show how that line between reality and fiction that becomes increasingly blurred as she wanders the hallways of the Abbey, awaiting intrigue and terror around every corner, but never finding it. One thing this production emphasized for me, is Austen’s stunning characterization. 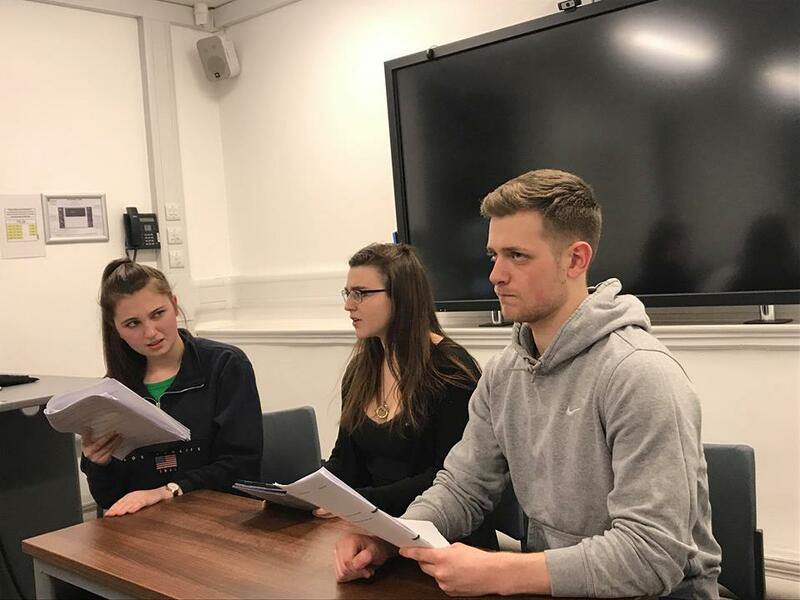 Sophie Wright’s script sees the most loveable characters rubbing shoulders with people who are so awful and self-obsessed as to be hilarious; we see tragedy and heartbreak side by side with heartfelt romance and innocent comedy. The characters are well-crafted and distinct, brought to life by a brilliant cast with care, comic timing and a lot of jokes about horses. People don’t always turn to Austen expecting side-splitting comedy, but this was an author who had lived in high society too long and was all too ready to turn her razor-sharp wit to satirizing it – you only have to look at John and Isabella Thorpe. So much love has gone into this production from all directions; we have worked tirelessly to bring this intelligent, touching, fascinating novel to life. This is the story of a young woman learning about the world beyond the pages of the novels she reads in her tiny village, navigating her way through “broken promises and broken arches, phaetons and false hangings, Tilneys and trap-doors”. There is something in this play for everyone – I hope you enjoy it. Northanger Abbey is on at 8pm, 9th- 10th February, in Castle Great Hall.